Opening ceremony of the Memorial day for Israel’s fallen taking place at the Western Wall in Jerusalem. In the first euphoric weeks after Israel liberated the Western Wall in the 1967 Six-Day War the site functioned as a national symbol that united all Israelis, religious and secular alike. Hundreds of thousands of people from all walks of life flocked to the Old City to touch the ancient stones after 19 years of separation. Jews of the Diaspora, too, wept with relief, rejoicing with Israelis over the newly unified Jerusalem. But that unity was short lived. After the site was placed under the control of the Orthodox authorities, secular Israelis and non-Orthodox Diaspora Jews—both of whom were pushed aside—responded differently to the arrangement. For Israelis who grew up on national and secular values, the Kotel served—and serves—as a historical national connection to generations past. They do not view the site as a synagogue, because most have no need for synagogues. Furthermore, they tend to accept the fact that matters of personal status, such as marriage, divorce and burial—along with kashrut and Shabbat observance in public spaces—are under the auspices of the Orthodox rabbinate. When they are in need of a synagogue experience, they tend to turn to Orthodox practices. To this day, some secular Israelis hold bar mitzvah ceremonies in the men’s section of the Kotel. That is why most could never understand why feminist women would have any reason to hold prayer services there, read Torah or wear a prayer shawl. 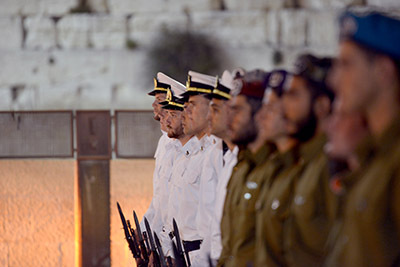 Most secular Israelis are also content with the fact that the Kotel plaza serves as the site for national military ceremonies, including the swearing-in of newly inducted soldiers and the official memorial service on Yom Hazikaron, Israel’s Memorial Day. For their part, the liberal movements in the Diaspora, which, 50 years ago, were almost completely unknown to Israelis, did not want a fight over the Kotel—or over any matter of religion and state in Israel. In 1968, when the American Reform movement held its international convention in Jerusalem, its leaders asked the Israeli authorities to conduct a mixed prayer service at the Western Wall. They were turned down. It took decades until liberal Jews felt confident enough of their place in the Jewish state to demand their rights, including having conversions performed by their rabbis recognized for the purpose of the Law of Return. This change came as American Jews began traveling to Israel more frequently. In the 1960s and 1970s, thousands of American Jews, including liberal Jews, made aliyah. Many of the immigrants settled in Jerusalem and began to set up synagogues and other institutions. Today, the Reform and Conservative movements point to more than 100 synagogues across the country, along with youth movements, summer camps and a network of schools. This fall, the Hebrew Union College-Jewish Institute of Religion, the Reform seminary, will ordain its 100th Israeli rabbi, an indication that native-born Israelis are now taking the lead in the liberal movements in Israel. By the 1980s, as their local impact grew and their North American counterparts became deeply committed to promoting religious pluralism in Israel, the liberal movements were ready to demand equal rights. Similarly, a new movement of religious feminism emerged in Israel that included prominent Orthodox and non-Orthodox women who began holding their own prayer services at the Kotel. Today the Kotel stands as a wounded symbol for many religious Jews across the spectrum. The place that was supposed to be a homecoming for all Jews has become a battleground among religious Israelis and a point of contention between the Israeli government and liberal Diaspora Jews. As we mark the 50th anniversary of our return and reunification, a new vision for inclusion and pluralism will have to take root for the Western Wall and indeed for all of Jerusalem to fulfill its prophetic promise. Elan Ezrachi, Ph.D., is a Jerusalem-based educator focusing on Jewish peoplehood and a community activist. Rabbi Naamah Kelman is a Reform rabbi and the dean of Hebrew Union College-Jewish Institute of Religion in Jerusalem.